Announcement Hey guys! Thanks for comin' over. Was looking around for some awesome stuff like candles, soap, and body wash that smell like guy things... leather, hunting lodges, barbershops etc... and couldn't find anything. So, I made them myself! And NO lavender. We hate that crap. Hey guys! Thanks for comin' over. Was looking around for some awesome stuff like candles, soap, and body wash that smell like guy things... leather, hunting lodges, barbershops etc... and couldn't find anything. So, I made them myself! And NO lavender. We hate that crap. Ordering was easy and I was sent prompt updates about my order status. The campfire aroma adds a wonderful dimension to the enjoyment of sitting by my electric fireplace. Fantastic candle. It is a very soothing and relaxing smell. Will be purchasing more in the future for sure. 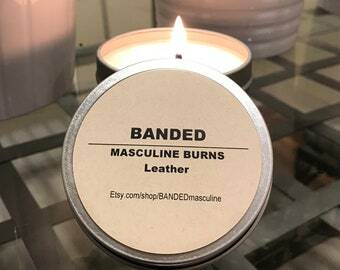 Candles with masculine scents. No lavender... we hate that crap. Body wash that's clean and manly. Bar soaps that are clean and manly. Stuff that smells manly and clean. No lavender... we hate that crap. Just a radio guy who couldn't find any masculine smelling candles, soaps or body washes so I made them myself! NO LAVENDER... we hate that crap.